No sooner am I home from Star Wars weekends, but what we've been hoping (and waiting for) has finally been announced - a Star Wars Marathon weekend. This was always under speculation by many. But, many thought it would be Walt Disney World, that it would be May or something different than what it is: January (old Tinkerbell weekend) in Disneyland. I figured something (not necessarily Star Wars) would take over that slot, as Disney already has the permits in place for the roads, and knows they can make money. And it's a holiday weekend. It would have been very unpleasant if they had announce a half marathon in Florida. In May. Could you imagine? Anyhow, RunDisney teased throughout the morning hours with these sly pictures and video (all from RunDisney's Instagram or Facebook page). 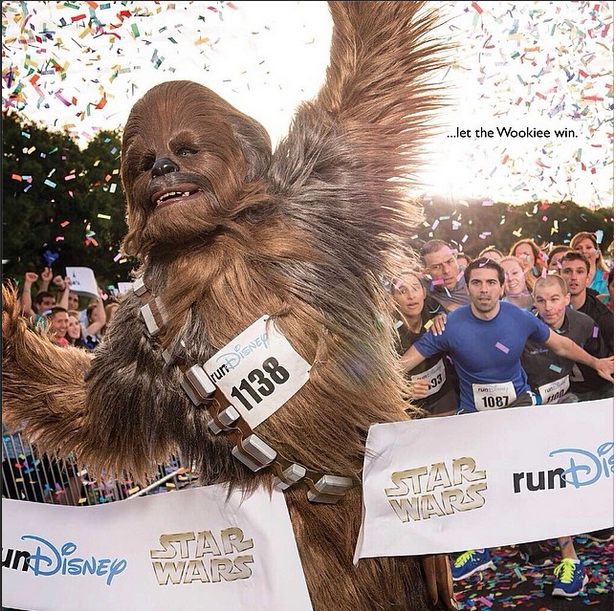 So I leave you with this: #letthewookieewin.